100 years ago today, something amazing happened. In the midst of the horror that was World War I, men stopped trying to kill each other, came together between the lines and celebrated Christmas. December of 1914 was still early in that epic struggle and both armies had only recently given up mobile warfare and settled into the trenches that have come characterize The Great War. The previous month had seen the end of the Race to the Sea which had resulted in a series of fortified positions reaching from the Swiss border to the North Sea in Belgium. In the days leading up to Christmas in 1914, there had been some attempts at arranging a truce: one by a group of British suffragettes and another by Pope Benedict XV. Both were unsuccessful. As is usually the case in war, it fell to the ordinary soldier to get things done. It all started in the Ypres sector, where German troops decorated their trenches with candles, put up Christmas trees and began singing Christmas carols. British troops across the way began singing carols in return and, eventually, a few troops from each side ventured into No Man’s land and exchanged gifts of food, tobacco, alcohol and souvenirs((buttons, caps, badges, etc)). Artillery fire ceased and the truce allowed both sides breathing space to recover their dead. There are even stories of football matches(soccer games to us barbaric Americans) between the combatants. The truce wasn’t confined to the Ypres region, nor just to the British and Germans. In the Commines sector, a similar truce occurred between French and German troops(no football matches, though) and the soldiers, who only days before had been doing their level best to murder each other, met between the lines, exchanging food, cigarettes and alcohol(the fuel that armies really run on). Some of these truces ended Christmas night, while others lasted until New Year’s Day. But, for a few days, soldiers on both sides were able to recover a little bit of humanity in that hell on earth. Of course, the generals were not happy with the truces. They knew the dangers inherent in these events: if their troops spent too much time with the enemy, they might begin to see them as human beings and that would ruin everything. It’s a lot easier to kill a Hun or a Boche than it is the fellow with whom you shared a cigarette and compared notes about family. Commanders issued orders forbidding contact with the enemy, but they were mostly ignored(a notable exception was Adolf Hitler). After Christmas, the generals got their wish and things went back to “normal”, with each side attempting to dismantle the other. Spontaneous truces broke again in 1915, but not on the same scale. Maybe the orders against fraternization issued by commanders had some effect. Or maybe another year of brutality had squashed the desire to put aside differences and celebrate the birth of a man called the Prince of Peace. Who knows. What we do know is that 1915 was the last time that troops met between the trenches, exchanging gifts and greetings. 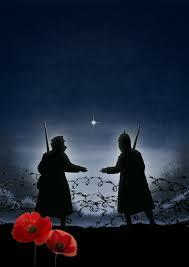 Subsequent Christmases saw soldiers singing carols to each other or throwing gifts across No Man’s Land, but nothing more. What can be learned from Christmas 1914? Well, if men involved in a conflict as horrific as WWI can put aside their differences for a little while and behave like human beings, should it be so hard for us to do the same today? Maybe if we took a page out the German’s book and extended an olive branch to our enemies (both personal and national), things might turn out okay. Stranger things have happened, you know.